It is so weird to me to have two popes. When a pope dies he is still referred to as pope. We now have a "dead pope" who speaks from the "grave." How cool and maybe dangerous is that for the "living pope" and his agenda? Distinguished Mr. President of the Republic of Poland! With great and profound emotion, gratitude and joy, I learned the news that, on the occasion of my 90th birthday, with the honorary patronage of the President of the Republic of Poland, high representatives of the state and ecclesial authorities of Poland will meet for a scientific conference on the theme: "The concept of the State in the perspective of the teaching of Cardinal Joseph Ratzinger / Benedict XVI". The chosen theme brings together state and ecclesial authorities to dialogue about an essential question for the future of our Continent. The clash between radically atheistic conceptions of the State and the emergence of a radically religious state in the Islamist movements, leads our time into an explosive situation, the consequences of which we experience every day. These radicalisms urgently demand that we develop a convincing conception of the State that sustains the clash with these challenges and can overcome them. In the travail of the last half century, with Bishop-Witness Cardinal Wyszyński and with Pope Saint John Paul II, Poland has given humanity two great figures, who not only reflected on this question, but have brought to it their own suffering and lived experience, and thus they continue to point the way to the future. 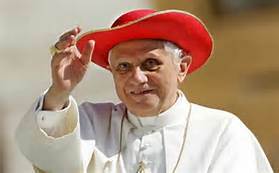 To me, HH Benedict XVI has exercised his retirement ministry responsibly without creating controversy or division in the public forum. Without question, I pray for our Holy Father, Francis and respect his office however, I cannot help but miss Benedict, how he exercised his ministry, portrayed the papacy so beautifully and spoke/wrote so definitively. On the occassion of his 90th birthday, I pray that he is granted many more years!